Teaching students to become great narrative authors and creative writers can be a tough task for even the most accomplished teacher... UNTIL NOW because the NARRATIVE & CREATIVE STORY WRITING UNIT offers a COMPLETE SOLUTION to teaching students how to craft CREATIVE CHARACTERS, SUPERB SETTINGS, PERFECT PLOTS and BEAUTIFUL NARRATIVES. ✅ Creating non-linear narratives as "Choose your own adventure stories." Perfect for Google Classroom, Office 365, SeeSaw or other digital platforms. Also includes a Print version of everything. 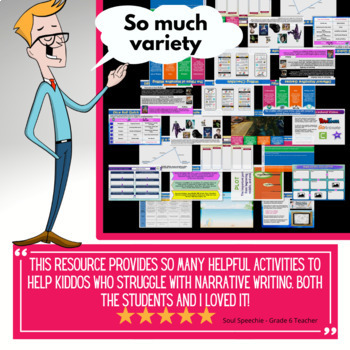 This HUGE BUNDLE offers a mix of hands-on, printable, and digital media resources. 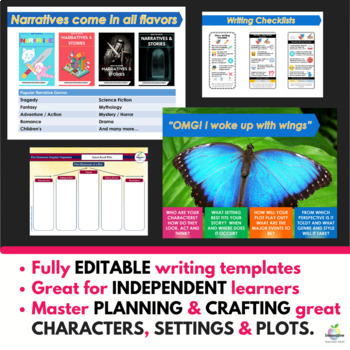 By the time you have finished this pack, your students won’t just be able to READ and COMPREHEND Explanations, but will also be WRITING their own with a high level of STRUCTURE, INSIGHT AND KNOWLEDGE. ✔ A concise teaching guide that can be taught to a class or self-directed by students. 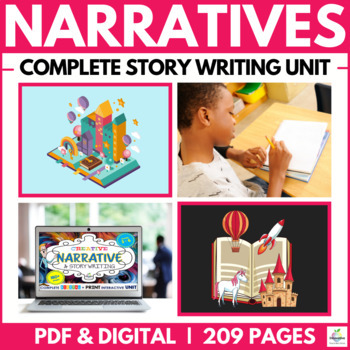 ✔ Structure and Features of great narratives and creative stories. The entire collection is provided to you in EDITABLE PowerPoint and as a printable PDF eBook. Each lesson is a complete plan that eliminates your preparation time, but if you need to modify the content to suit a particular class, you can easily do so.